This is patch Tuesday and Microsoft release another round of the updates KB4457128 and KB4456655 for Windows 10 users running version 1803, 1709, 1703, and 1607. You can install the cumulative update KB4457128 directly from the Settings app. Open the Settings app using Win + I, go to, "Update and Security -> Windows Update" and click on the "Check for updates" button. Windows 10 will automatically download and install the updates for you. This approach ensures that Windows downloads and installs prerequisite update KB4456655 before installing KB4457128. Download links for both updates can be found below. After the installing the update, Windows 10 version will go from 17134.254 to 17134.285. If the Settings app method didn't work or for any other reason, here are the direct download links for Windows 10 KB4457128 update. Using this link you can download both 32-bit and 64-bit versions. Note: Before you can install KB4457128, you need to install the pre-requisite update KB4456655. If you don't, you might not be able to install KB4457128 update. Download link for KB4456655 is below. 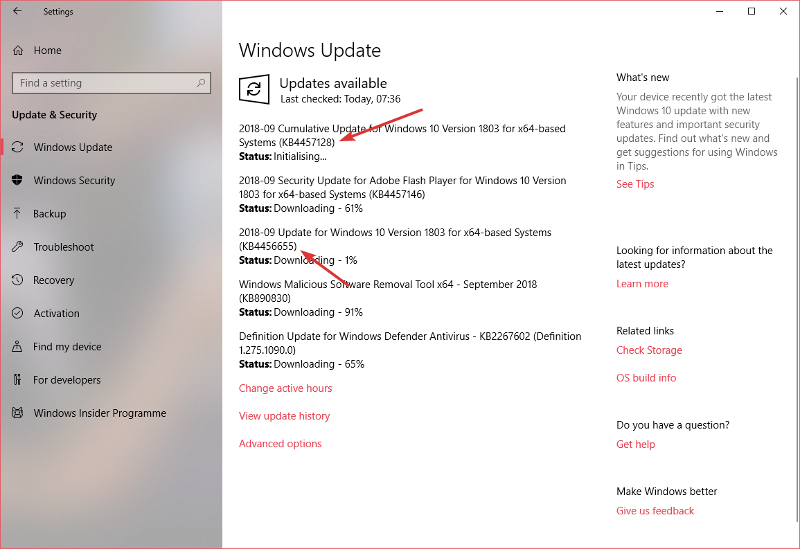 KB4456655 is a Windows 10 Servicing Stack Update (SSU) and it needs to be installed before you can install the cumulative update KB4457128. In case you don't know SSUs are released to install other operating system updates and also contains Component-based Servicing Stack updates for several underlying Windows components such as DISM, SFC, etc. Here are the direct download links for KB4456655. You can download both 32-bit and 64-bit version of the update from this download link. Updates causing problems? If you want to, you can pause Windows 10 updates.